Replacement Tubing for Aircast Cryo/Cuff System. Connects cooler to various pads. Replacement Item: This replacement item may ship directly from the manufacturer and require an additional lead time of 5-7 business days. Please be sure to factor this information when calculating your ship time. How high does the cooler need to be after the brace is filled with water. 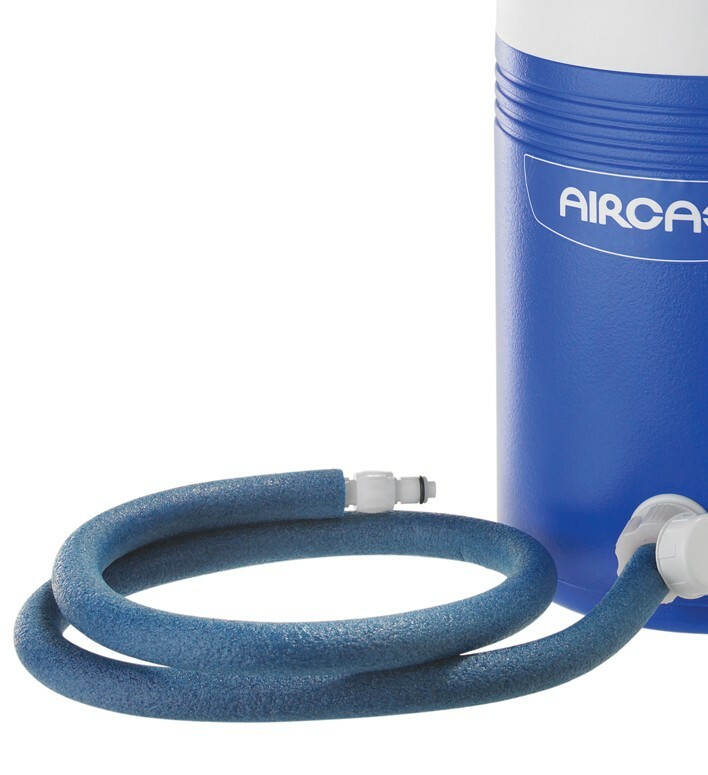 The Aircast Cryo/Cuff Cooler needs to be higher than the injured area to offer the compression. Where can i get the white connection apparatus that transfers the water from inside the jug to the tube. I understand you don't sell that piece (bulkhead) but can you direct me to who does? Thank you for Contacting Betterbraces. Are you speaking of the hose? Or the white piece at the end of the hose that screws onto the cooler? If so, you can purchase the replacement hose. Can I just by the hose to cuff conector? What sise is the threaded tube? I just want to make sure that tube will fit before I buy it. If you have a aircast Cryocuff the tube assembly will fit it. I need a longer tube where I sit with my cooler. Is there an extension tube available? Does the new tube have a shut off. Mime came with a lil plastic clip. Does the replacement tubing include the plastic assembly that connects to the tube and provides passage for the water through to the inside of the cooler? That assembly has a threaded end for screw-on attachment to the tube, and also a threaded end for a screw-on flange piece at the inside of the cooler. I've broken that plastic piece with the threaded ends. BTW, I have a very old Cryo/Cuff (20 years old). Do you sell just the o-ring on the hose of cyro/cuff? Thank you for your question. We do not sell just the O-ring. You would need to purchase the Tube Assembly. I had this machine AIRCAST Cryo/Cuff IC at Columbia Presbyterian Hospital after I had "totaly right knee replacement", so when I left the hospital for nursing home I took the machine without the power cord. Very soon I will have the left knee surgery and I want to use the machine. Can you help to get in posesion of a power cord or probabily give me some technical information about it that i can buy it in the store. The best for me is to buy it anew one from you. Does the Replacement Tubing for Cryo/Cuff include the screw on cap that connects to the tubing? The tube assembly does include the attachment pieces on both ends of the tube: the clip attachment to the cuff and the twist on connector for the cooler. I am very sorry but that piece is not replaceable. It does not come with the tube assembly. The unit will have to be replaced.